Perfection is simply when you have nothing to remove. Like a diamond, you only get it when all the impurities have been removed. And I believe it applies in the same way to our lives. 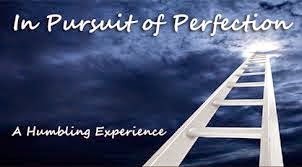 In our pursuit of perfection, we shouldn't aim to add to our lives but to remove what shouldn't be there. The impurities. The aim is to be able to look at your life and see that there is nothing there that you will want to do away with. That is perfection. According to Leonardo da Vinci, the ultimate sophistication is simplicity. It is harder to get rid of the junks and impurities in our lives than to add all those surface beauty we bother about. Whenever you think of a perfect life as owning a Ferrari, or earning millions monthly, or having a luxurious house; you are only thinking of wealth and not perfection. Perfection is when you have a life that is not weighed down by unnecessary baggage, a life that is beautifully simple, a refined life, a life that is motivated from within and not from external possessions. For some of us, having a perfect life means living on our own terms. Getting rid of strong external influences that try to steer our lives. I fall under that category, and it is why I decided to work for myself than risk being downsized out of job again. Losing one's job is a very strong external influence, and a terrible one. It has happened to me once and even though I got another job the next month, I never recovered from it. It's the main reason I tell myself almost daily that I just have to make this entrepreneurial thing work. Living life on my own terms matter more to me than wealth. Knowing that I haven't left any potential source of negative disruption in my life that I could have fixed gives me fulfillment. Getting wealth and stuffs can be learned and attained regardless of what path one follows but achieving a life that is full of only the things you want in it requires strictly following a particular path. The path of self-actualization. Being only what you want to be. It focuses on being and not having. It stresses the need for self-discovery and being true to oneself. It is the path we all most follow in pursuit of perfection. Writing Is Thinking; Reading Is Pruning.